I’ve been meaning to read a book by Jim Hines for about nine months now, ever since I saw him competing with John Scalzi in a fantasy cover pose-off for charity (not his first time doing such a thing, but the first I’d been aware of it via Scalzi’s Whatever). Since then, he seems to be everywhere, defending the rights of women to be geeks, defending the rights of geeks to like whatever they want to like, and defending his own right to say and do whatever he wants in support of these things. All the stories I’ve heard about him have been delightful, and when it comes right down to it, nothing makes me want to read more than liking the person behind the story. I’ve discovered that when I know a little more about an author, when I’ve heard about his or her life, I’m inclined to like the book just that much more. It’s especially important now that the internet is a thing; when I was a kid, I probably read and enjoyed books by all sorts of simply terrible people, and I never had a clue. That was fine. I didn’t have immediate access to blog posts, tweets, or Wikipedia pages for essentially every author I read, and maybe it was better that way. Who am I kidding? Of course it was better. I read so much more before the internet and all of its distractions! I didn’t know terrible things about writers whose books I love! I didn’t have deep existential debates over nearly as many authors because I was too busy stuffing myself with delicious stories! And yet, the internet has its uses, doesn’t it? For example, through this blog, I’ve been able to at least tangentially connect with almost 9000 people who love books with a passion kindred to my own. I also hear about and buy books with an abandon that borders on disturbing. Thank God for ebooks, which I basically treat as another limb, and for sites that recommend people like Hines – authors perfectly suited to my taste because, well, the internet is equipped to do such a thing. Alright, so the internet is brilliant, and it also drives me crazy, so I guess that makes me…normal? 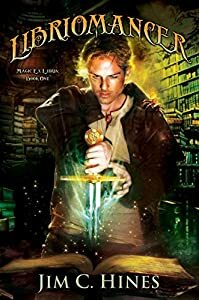 I get distracted by it, but then it leads me to a sweet, funny, wonderful urban fantasy like Libriomancer and I get all excited all over again. I like that with a couple clicks, I can find out what conventions Hines goes to, or that the first few chapters of the sequel to Libriomancer is available for free on his website. It makes me happy to know I bought a book in support of a nice guy who tries to make a difference in his community of fans, and I think it’s great the internet is a powerful tool for him to speak out when things happen in that community that upset him. I don’t know how great an effect such knowledge had on me when it comes to enjoying his novel. I already love the genre he writes in, and I’ve always had a soft spot for funny, bumbling protagonists, so if I had come across this book in a store, I’m sure I would have bought it and enjoyed his work because he tells a good story in a way I like to hear it told. It doesn’t hurt though, that in this case, the internet played the part of an excellent librarian, or a friend with complimentary reading taste. I don’t get recs from either type of person very often anymore, so the ability to discover new authors hinges, more than I’d ideally like, on this massive web of information. If you find yourself craving more about Jim C Hines work, check out his site (and its free samples) here. Based on the cover of the book, I’m assuming it’s an Urban Fantasy targeted at the Young Adult audience? I really hope so, that’s a genre that needs more love from authors who aren’t writing incredibly trashy paranormal romance (please note that I have nothing against paranormal romance novels when they’re well written, in fact reading them is a guilty pleasure of mine. I just despair at how much of it is poorly written trash filled with terrible role models for young women). In regards to the comments around your knowledge of an author affecting your enjoyment of their work, I’ve found personally that it doesn’t so much affect whether or not I’ll enjoy their work so much as it influences whether or not I’m even likely to read their work. For example, I still love some of Orson Scott Card’s novels (particularly Ender’s Game), but I cannot stand his attitude and views on a lot of topics. Now if I’d not read his novels before finding out about his views, odds are I’d have never picked them up unless someone sat me down and forced me to. I have a similar situation with one of my favourite Scottish authors, who shall remain nameless as the issues I have with him are actually from first hand accounts, not online information, and I don’t want to spread the stories without permission from those involved. Again, had I known about these situations first, I’d never have picked up the first book. As it is, I’ve got everything he’s ever written, and I read all of them at least once a year. They’re just that good. My dislike of him means that I’m not ever going to be rushing out to get them signed, should he make his way to Australia at any point, but I can disassociate my issues with the man from his work. Still, I suppose it’s different for everyone, as with most things. We each react in our own way. This isn’t specifically YA, but it’s certainly something I would recommend for that audience. I find that most urban fantasy falls into that category in my experience. I certainly loved it when I was younger (and who am I kidding? I love it now too!). Also, it’s funny that I got two comments about Card on this post, because I actually wrote about him a few months ago: https://booksjadore.wordpress.com/2012/04/09/ender-in-exile-orson-scott-card/. I have the exact same issue with him, and with a few other writers who I love but now that I have so much information, it’s difficult to appreciate his work the way I used to. I suspect that the reason Card is coming up so much at the moment is due to the Enders Game film. There’s been a lot of press related to Card’s views on homosexuality and so on during the production, and a lot of people who wouldn’t have been aware of that side of him before would have been exposed to it very suddenly. If you enjoy Urban Fantasy, may I recommend checking out the Urban Magic novels by Kate Griffin (actually a pseudonym for Catherine Webb, but she uses Kate Griffin for her adult fiction). There are four books so far, A Madness of Angels; The Midnight Mayor; The Neon Court; and The Minority Council. They’re set in present day London, and follow the story of Matthew Swift, one of the last remaining sorcerers who has been resurrected two years after his murder, however when he returned, he was merged with an occult being known as the Blue Electric Angels. The series has a really interesting take on magic, where it mirrors the current state of civilisation. So binding spells use things like police tape and stop signs, graffiti has replaced magic circles, and wizards summon barbed wire from the ground instead of vines. There’s also a follow up series (though I’m hoping that we’ll get some more books entirely focused on Matthew at some point) called Magicals Anonymous, which follows Sharon Li, a novice shaman of the city of London, and her “tribe” of misfits who showed up to her new support group for the mystically challenged, including Rhys, the Almost Nearly Chosen One of the Druids; Sally the modern art loving banshee; Mr Roding the Necromancer, who really just wants to find a find a way to stop his skin from shedding; and Jessica, who turns into a flock of pigeons when she’s nervous (it’s all a matter of conservation of mass). First book was Stray Souls, second one is Glass Gods. Haven’t had a chance to read Glass Gods yet. Anyway, I highly recommend them, they’re my favourite urban fantasy novels at the moment, as shown by the fact that they’re also on my list of books to read every few months. Thanks for the recs! I’m always on the lookout for great urban fantasy, and it’s a genre that is so hit or miss that it’s nice to hear other people have found fun, worthwhile reads! I know I like a story better when I know more about the author. I’m really kind of nosy though, and love to get into the nitty gritty of peoples everyday life. The internet is great for that! I love the internet, but man, it’s so exhausting sometimes! So much information!!! I still have issues about separating the author from his work. It was easier for me to ignore the authors before the internet and be as objective as possible. For instance, I found out that the author of Ender’s game, which I loved, is actually a homophobe and generally not a very likeable person. It’s a weird aftertaste now, I have to admit. I wrote about him here: https://booksjadore.wordpress.com/2012/04/09/ender-in-exile-orson-scott-card/ because I loved him for years before knowing about that, and it does make it a lot harder to enjoy his work now. As much as it troubles me I am glad to have found out about it later, because Ender is a very special guy for me. I still cannot understand how Card managed to write such understanding and warm books if he’s obviously full of hate. I’ve heard a number of rumors that his behavior has gotten much worse as he’s aged. I try to hold onto that because I adore his books, and they also are incredibly special for me.